Learn about herbaria and the techniques we use to preserve and study plant specimens. 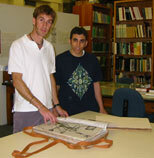 A herbarium is a collection of plant samples preserved for long-term study. These collections are diverse, including pressed, dried and mounted plants, seeds, wood sections, pollen, microscope slides, frozen DNA extractions, and fluid-preserved plant specimens (esp. flowers or fruits). The practice of herbarium taxonomy encompasses specialized techniques used to preserve and study the collections stored in a herbarium. Herbaria and Herbarium Specimens - What is a herbarium? How is it used? PLabel, a free program for generating herbarium labels. Resources and Services Guide for UF Faculty, Staff, Students and Other Researchers - a guide to the collections and services available in the Herbarium. Webmaster@[N0-SPAM]flmnh.ufl.edu, Florida Museum of Natural History for technical assistance.